Since 2003 we have carried out a huge number of contracts for a diverse range of clients. We were engaged by the Dutch steelwork contractor Zuid Nederlanse Staalbow to set out all of the holding down anchor bolts in both Terminals 5 & 5A. In total we set out over 17’000 bolts to a tolerance of +/- 2mm. 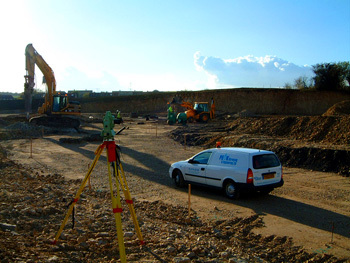 We commenced our work on site in September 2004 and made regular visits to site until late 2006. Our remit was to ensure that all of the anchor bolt positions were marked out around two weeks in advance of the erection team. This enabled the erection team to advance at an efficient pace, without any hold up caused be out of place anchor bolts. We were also responsible for the alignment of the steelwork as well as ensuring that it was constructed to the correct levels. Again working to extremely tight tolerances in a difficult environment. Once a section of steelwork was complete, we carried out an as built survey to ensure that it was within tolerance. We also carried out precise as built surveys on behalf of an international baggage system specialist, Vanderlande Industries. Our work involved carrying out as built surveys of the building superstructure and comparing it to the design drawings. Any discrepancies could then be highlighted, and the design team informed. Any design changes could then be made prior to the manufacture / installation of the baggage system. With over 18 kilometres of conveyors and associated machinery to install to tolerances of +/-2mm in certain locations, unnecessary complications are unwelcome! We returned to site in February 2009 to carry out the next phase of work – Terminal 5C. Engaged by both Hollandia (formerly ZNS) and VI we carried out similar tasks to our previous visits, setting out over 5000 holding down bolts to the same exacting standards. 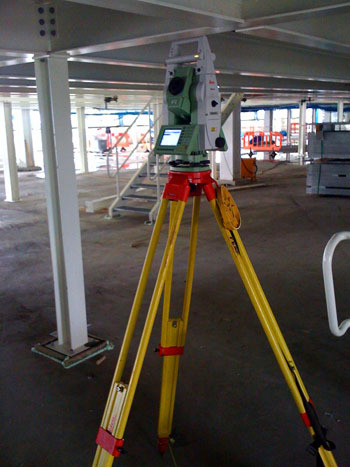 We also carried out as-built surveys and monitoring using our high accuracy Leica TCRP 1201 instrument. We currently have a presence on site within the Terminal 3 Western Interface Building. Here, working once again for VI and also JCK, we are performing the same duties as we did on the previous contracts. Once again working for Vanderlande Industries, we were tasked with surveying a specific section of baggage conveyor, behind the scenes, within Stanstead Airport. The purpose of the survey was to provide a 3D model of the existing baggage conveyor and the fabric of the building immediately adjacent. We spent four days on site collecting data in and around the “live” conveyor and screening office. Back in the office the data was processed and a 3D model produced. The design team at VI were then able to take our 3D model and design a new conveyor to run alongside the existing conveyor utilising existing structural steelwork whilst passing above / beneath existing services etc. Another valued repeat client, Interserve, which is one of the worlds largest construction companies asked us to carry out a pre-start OGL survey of part of the grounds of Kettering General Hospital. A very detailed topographical survey was carried out with particular emphasis on ensuring that all of the undulations of the grassed area were surveyed. Six months later and we returned to site to re-survey the same area following the bulk excavation works carried out by civil engineering sub-contractor, for the basement of a new treatment centre. Our survey showed up large discrepancies in the quantities which the contractor had claimed and enabled the client to save over £50’000. 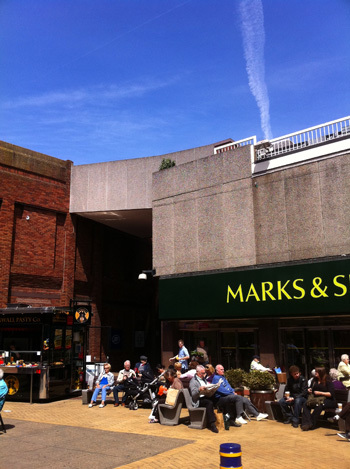 The management of Eden Walk Shopping Centre appointed a national cladding specialist to give their centre a facelift. The brief was to cover all of the drab 1970 pre-cast concrete panels with a new façade of either glass or zinc. We were contracted to provide as-built drawings of all of the canopies and elevations throughout the shopping centre. The drawings needed to be extremely accurate and to include all of the features present. The contractor was then able to take our drawings and cut all of the cladding elements to size in the factory ready for installation on site. We were contracted to provide as-built drawings of all of the canopies and elevations throughout the shopping centre. The drawings needed to be extremely accurate and to include all of the features present. The contractor was then able to take our drawings and manufacture all of the cladding elements to size in the factory ready for installation on site. The survey was carried out whilst the shopping centre was open for business and the deliverables presented on time and within budget. We were contacted by an international supplier / installer of automated logistic solutions who requested that we carry out an as-built survey within a new purpose built 400’000 sq ft distribution facility. The equipment has to be installed to very tight tolerances so a detailed survey of all of the steel columns, internal walls and lift pits was required. Working alongside the building contractors we surveyed over 500 columns to record the as built position, orientation, alignment and verticality. Since our inception in 2003 we have been providing surveying services to an established Cheshire based civil engineering contractor, OBY Ltd. Working throughout Derbyshire, Nottinghamshire, Yorkshire and Cheshire we have set out over 100 kilometres of roads and sewers. The fact that we still carry out ALL of OBY’s surveying duties EIGHT years on is testament to our accurate and efficient service. We have also carried out engineering works for a number of other similar civil engineering contractors on both residential, commercial and local authority projects. We have travelled throughout England and Wales on behalf of a number of leading piling contractors. Setting out a huge number of piles on both commercial and residential projects. Our ability to set out to the prescribed tolerance and to resolve any problems whilst on site in an accurate and efficient manner has ensured that the contractors regularly engage our services. Through the winter of 2008 – 2009 we had a daily presence on site in Wisbech for the UK’s largest piling contactor. It was a challenging project with 7 piling rigs working at the same time installing over 5000 piles. We worked alongside the rigs ensuring that we had set out enough pins to enable the seven rigs to work un-interrupted. 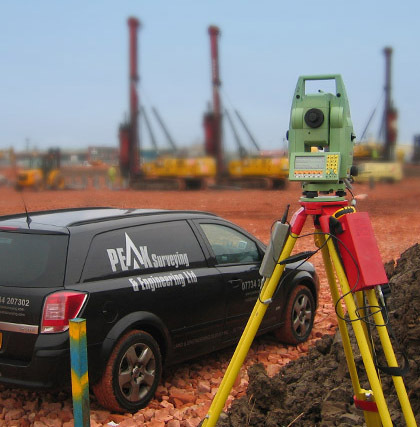 We also surveyed the positions of the installed piles and produced as-built survey data. Any piles that had drifted out of tolerance whilst being driven were identified and remedial action taken. Quite a demanding task given the cramped working conditions and the tolerances that were required.